[UPDATE 10/19/17] Due to low demand, Bitcoin is no longer available as a form of payment. Our apologies for any inconvenience this may cause. You can still complete your purchase through a number of alternative payment options such as PayPal, all major Credit Cards, and Dell Financial Services. 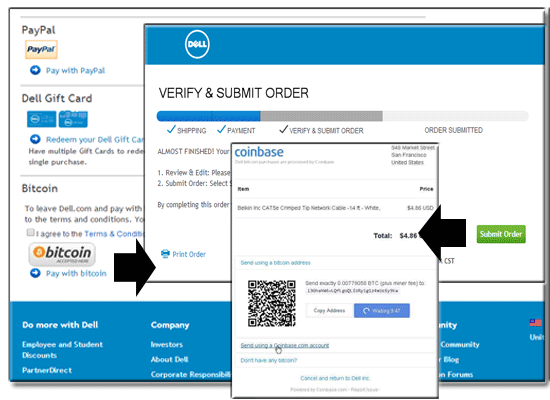 Now you can buy digital with digital – starting today, we’re accepting bitcoin on Dell.com. 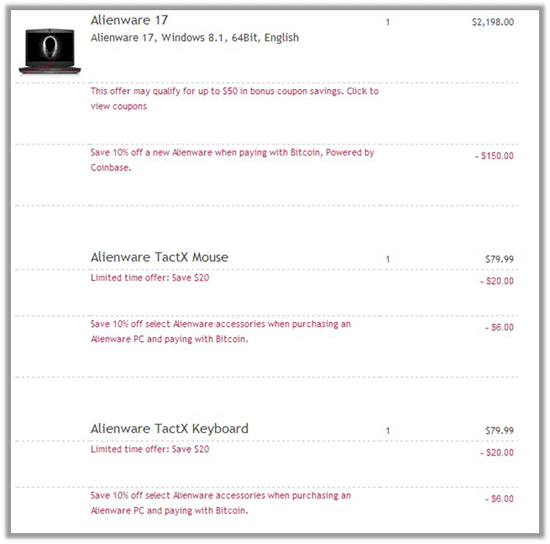 I’m excited to share in the coming days we’ll be offering a special Alienware promotion wherein customers can save 10 percent off a new Alienware system purchase (up to $150 limit) when checking out with bitcoin. Stay tuned to Dell.com/bitcoin for more information on this exciting offer. We know you have some questions. We’ve tried our best to answer some of them below, but if you have others, be sure to check out the Terms & Conditions and our FAQ, or feel free to leave them in the comments below. We have teamed with Coinbase to handle the processing of Dell.com transactions on the bitcoin network. Founded in June of 2012, Coinbase is an international digital wallet that allows you to securely buy, use, and accept bitcoin currency. Many other companies such as Overstock and Expedia are already using Coinbase to accept bitcoin. To acquire bitcoin, you’ll need to create a bitcoin wallet on a site such as Coinbase. This is the account from which you can send and receive bitcoin. Once you have a wallet, you can purchase bitcoin from Coinbase directly. Bitcoin can also be mined, though this requires high levels of processing power. This is something Dell Services customer Bitcoin ASIC Hosting found to be true, and is why they partnered with us to provide a large scale and high density crypto-currency hosting facility available to the Bitcoin mining community. The process of selecting products and services on Dell.com remains the same for bitcoin users as for everyone. Once your selections are made and you are ready to make a purchase, simply add the items to your cart and choose bitcoin as the payment method. You can send payment from your bitcoin wallet by using the generated bitcoin address, by scanning the QR code from your smartphone, or by using a Coinbase account. You can use bitcoin to purchase any products on Dell’s consumer, EPP or small/medium business sites in the U.S. Bitcoin will only be accepted online at the point of sale, not on existing invoices. Didn’t Dell already accept Bitcoin? While it was noted earlier this year that you could purchase Gyft cards with bitcoin and use those to shop on Dell.com, we are now pleased to accept bitcoin as a direct payment option via Coinbase. Wasn’t Dell Security warning about Bitcoin malware earlier this year? Our SonicWALL researchers did observe an increase in bitcoin mining botnets in our 2013 Threat Report. However, bitcoin adopters can take precautions to ensure security. We’ve enlisted Coinbase, one of the most secure, reputable and widely used bitcoin platforms in North America to help with this. Information on their security protection can be found here. Use a non-web-based wallet, always back up and encrypt your wallet, and ensure that the machine that is used to store the bitcoin wallet is malware free. After all, all other precautions are for naught if the machine is compromised by malware. Consider using open-source and trusted wallet software (Electrum, Armory) – Use only in deterministic mode. If holding a large sum of currency, consider moving the majority of it over to a cold-storage wallet. When access to those funds is needed, move them back to your “hot” wallet where they can then be spent. Our Alienware promotion mentioned above is now live! Note: This Alienware promotion ends August 14, 2014. Glad to see the excitement @leandrogmachado! @nadam9 – We'll be gauging customer demand during the pilot and then make decisions about expansion. Michael Dell say: "We’re Now Accepting Bitcoin on Dell.com". We're, Crypto Currency Foundation Russia (CCFR.info) say: "Congratulations from Russia with Love!". Best wishes. our friends! Hi! can i ask you if it's only for US or u will implement this alternative worldwide? just because i live in Argentina and it's hard to get the products here.. thank u! @AndresitoBsas – We'll be gauging customer demand during the pilot and then make decisions about expansion. WOWWWWW perfect! AWESOME news! We are very happy with this news! I'm DELL and BITCOIN Owner! Awesome! I hope you will extend this soon to other countries as well. I'm still using paypal, and really wondering what is better about bitcoin ? Please enable BitCoin for Switzerland soon. I need a replacement for my stolen XPS13DE. Yah Please enable BitCoin for Switzerland soon. BitCoin for Switzerland is still missing. I think Bitcoin is our future!!! To my mimd Bitcoin is our Future and amzing virtual money for real things!!! Bitcoins really great money in Future! Bitcoin is very powerful payment network and a new kind of money. After waiting for BitCoin to land in the Swiss store, I finally ordered at the US store. The eMail I got immediately afterwards stated that I should receive a confirmation within two days. That was two and a half weeks ago. To date I didn't receive anything from Dell. Because the order cannot be found in the system, I can't contact support. Somebody at the forum suggested that the order was cancelled because it is intended for export. He could not explain however why I didn't learn about that however. I really wouldn't have thought that the experience with Dell could be so bad. I stopped using coinbase since they closed my account for no reason. Moved to CEX.IO and it appeared to be far better service, I really like to buy Bitcoin using credit card.